Why house prices are going to do what you least expect. This chart from a Grattan Institute report was used as a hand grenade in a war over house prices on Twitter a couple of days ago. Union economist Matt Cowgill argued house prices may be too high if they are pushing people out of the market. Another economist, Stephen Koukoulas, argued everything was fine and you should just go and borrow from the bank since interest rates are at record lows. This is a pretty good theory to explain the above. 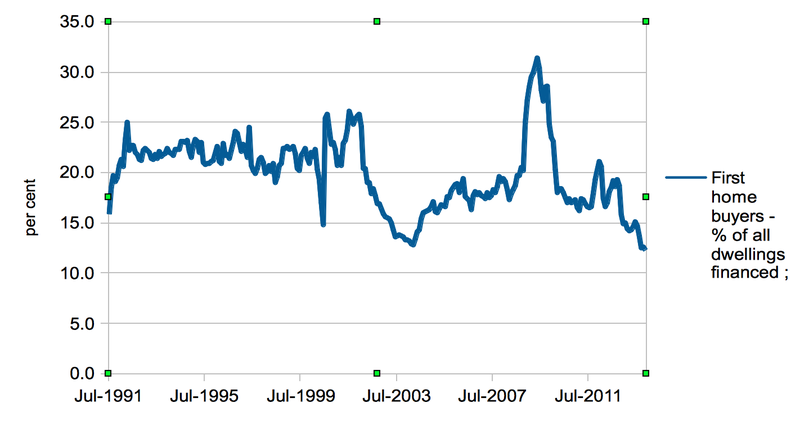 But it doesn’t do such a good job of explaining the declining rate of first home purchase. That has hit a record low of 12.3 per cent in the most recent data. You have to assume that low – which coincides with recent house price growth – is temporary. So what will give? Will we observe a quiet tsunami of saving that allows first home buyers to collect together huge deposits, then climb back into the market with heaps of spending power? Bad news if you are relying on that. Gen Y is not scrooging it up. While young people’s net worth rose around 25 per cent in this period, the price of established homes rose 40 per cent. The average value of the savings of people aged 25-34 (bank accounts and shares, not including super) has risen from $11,000 to $16,300. It’s not nothing, but it’s not exactly a deposit on a house, either. 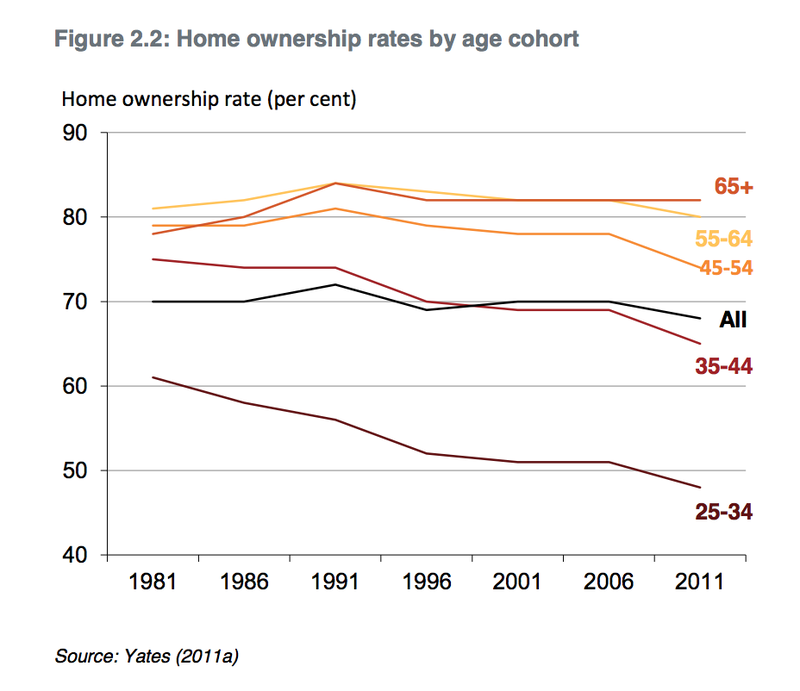 So will the 65+ demographic eventually be forced to release their vast real estate holdings onto an anaemic market? Can we conclude that house prices are going to fall? 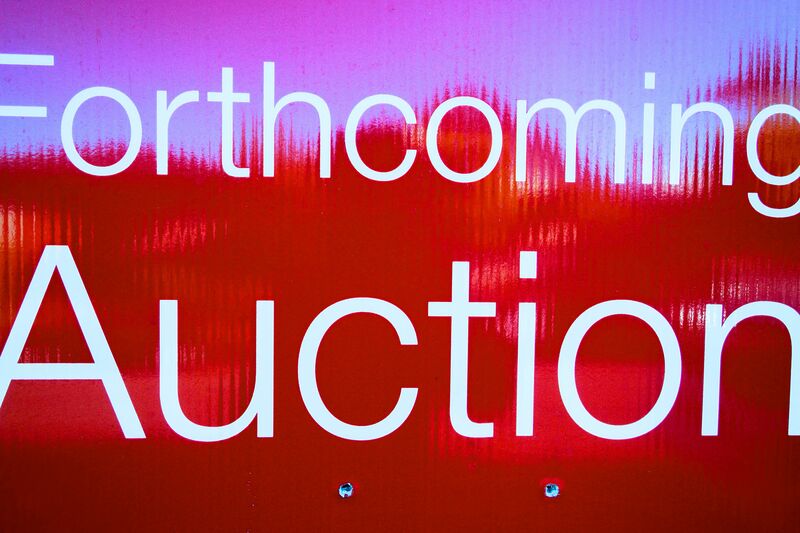 The x-factor in Australia’s housing market may be off-shore buyers. Chinese wealth is pouring into the market at both ends, propping up the value of both million dollar mansions and cheap apartments. One real estate agent recently told the ABC that 90 per cent of homes were selling to Chinese investors. Hyperbole, obviously. But even 1 per cent is cause to pay attention. Economists understand that markets operate at the margin. It doesn’t matter what most people do so long as at the margin there is one bidder with deep pockets. Foreign investment in Australian real estate rose from $41.5 billion in 2010-11 to $59.1 billion in 2011-12. Fast-growing China was the 3rd biggest source, behind the USA and Singapore. 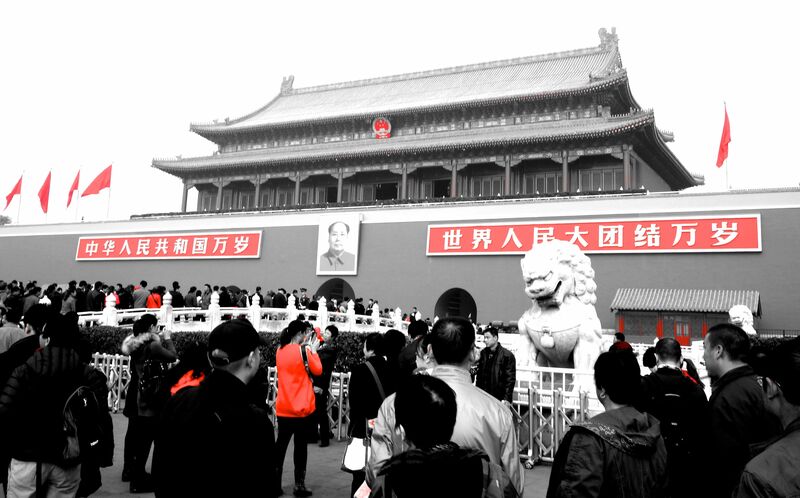 So long as foreign wealth, and especially Chinese wealth keeps accumulating, domestic dynamics are only part of the picture. I intend to return to this topic soon, because the pace of accumulation of Chinese wealth is now not just a historic record but a gigantic outlier. Whether it can continue is of intense relevance to all of us, and there’s plenty of people who think a crash is coming soon. Maybe it’s my bias for pessimism, but I have been amazed by the resilience of house prices. Prices have become unhinged from the utility of the asset and only make sense as a hedge against further asset price inflation and a slow but steady momentum. Other property markets have experienced corrections after long periods of growth but almost everyone can come up with a story to justify the high prices and why Australia is different. My theory is that access to limited resources such as schools and public transport coupled with the declining utility of the car have helped to drive up prices. I still believe their will be a correction, but it will be triggered by something that comes out of left field, will be predicted by almost no one and will appear obvious in hindsight. I actually went to an open for inspection for a mouldy studio apartment with no kitchen. It looked like someone had lived there taking crack until they died. It was advertised at a a gob-smacking $310,000 and sold for $370,000. So I think a correction is likely too! I think a Chinese bump in the road is possible and would shake global markets, causing quite a few tribulations for asset prices. The data come from ABS Household Wealth and Wealth distribution. The total net worth is a mean value. It includes all financial and non-financial assets, including super, businesses, private trusts, property, etc. Net of loans, debt, etc. The second number is also a mean. It is just the positive side of the ledger, and just the most liquid part, i.e. shares and bank accounts. Hmm, I can’t see any 25-34 age brackets in that document? (Or maybe I’m just having trouble finding them) – what page? 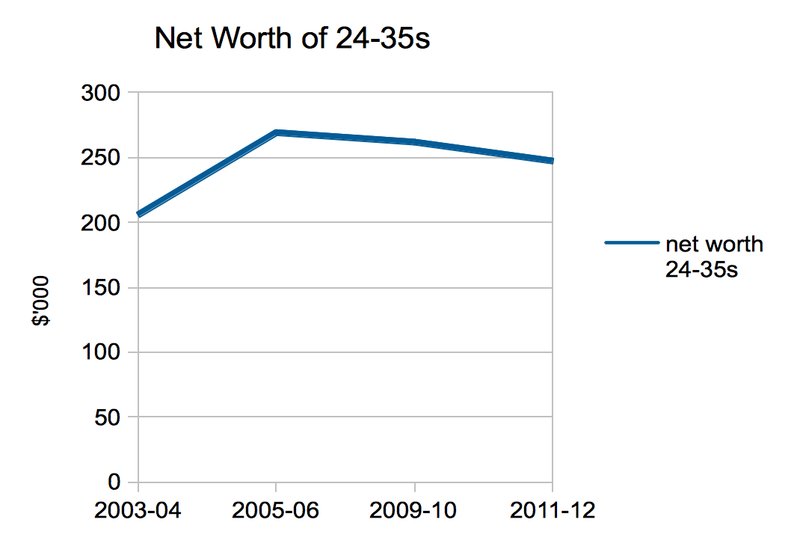 I’m just a bit skeptical that the mean wealth of 25-34 year olds is $250k. It seems high to me. (Or maybe the median is much lower). By “net of loans, debt, etc”, I take it you mean that a $300k house with a $250k mortgage only counts as $50k wealth. You make a good point. It seems high because that’s household wealth not individual wealth. I shall make that clear now. Next Next post: Work: nice to have. But not all the time.